It’s a very democratic way to sell art and it feels like a natural evolution for contemporary art. Although there is risk involved, I embrace the challenge of selling my work in this way. Expected to bring in at least $120 million over an evening and day sale, with a high estimate of $176.5 million, the auction exceeded all expectations by grossing $200.75 million over the course of two sales in the span of 24 hours, setting a record for a single-artist auction and skyrocketing the artist straight into (an even greater) superstardom. Hirst, who spent the auction playing snooker at London’s Groucho Club, walked away with $172 million and secured his place in history, just as the financial markets plunged in a global recession. The auction was later described as a kind of marketing and media/communications performance art. However, that auction seemed to mark his end as an art-market darling. Eleven years later, what is happening with the Damien Hirst art market? 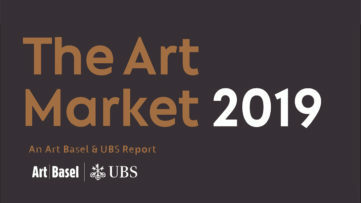 After gruesome sales during 2008 and 2009 in the midst of the recession, the art market recovered remarkably fast – after falling 40% between 2007 and 2009, it bounced back in as early as 2010, mostly thanks to the emerging Chinese market. After the 2008 Damien Hirst auction, it remained unknown how the buyers would fare if and when they chose to resell the works later. After the success of Beautiful Inside My Head Forever, it would have been expected that these works would attract outsized demand when offered again. However, nineteen lots, which were originally sold for a total of $8.1 million in 2008, garnered a total of about $5.2 million the second time, while only one sold for a slightly higher price than in 2008. For example, the work Beautiful Mider Intense Cathartic Painting (with Extra Inner Beauty) from 2008, which was originally sold for $1.2 million, went for only $546,000 at Phillips London in March 2017. According to these shaky prices results, the future is not looking so bright for the owners of the rest of these works. On the other hand, it seems that, as opposed to the secondary market, Hirst’s primary market is booming; the artist claimed that his 2017 exhibition in Venice, Treasures from the Wreck of the Unbelievable, totaled $330 million, while the works from the Veil series sold for between $500,000 to $1.7 million per canvas. Yet, all of the Hirst’s top ten prices, including the work Lullaby Spring from 2002, The Golden Calf from 2008 and The Kingdom from 2008, were all recorded in 2007 and 2008. His total turnover went from around $225 million in 2008 to around $20 million in 2018. Should Collectors Invest in Damien Hirst Art? However, Alex Rotter, Christie’s chairman of post-war and contemporary art for the Americas, is not so pessimistic. 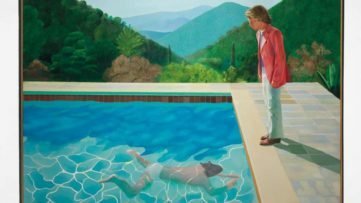 In an interview for The Art Newspaper, he explained that “this is a long game and Damien is not a one-trick pony,” adding that those “sharks and spots will be in all the art history books.” Indeed, the trends in the art market are continually changing. On September 20th, 2018, Sotheby’s London offered the works from the collection of Frank Dunphy, Hirst’s business manager of 15 years. Titled Yellow Ball: The Frank and Lorna Dunphy Collection, the auction sale offered over 200 artworks which charted the iconoclastic 1990s art scene, with the core of the collection being a number of works by Hirst. The auction garnered around $13 million, with Hirst’s Boys ‘n’ Girls ‘n’ the Sun from 2006 being the third most expensive artwork sold during the auction, going for $756,762, immediately followed by Epiphany from 2005, selling for $646,016, and Midsummer’s Nights Dream from 2002, selling for $614,374 and almost doubling its estimate. Smashing Yellow Ball at Peace Painting also doubled its estimate of between $100,000 and $150,000, going for $392,883. According to this, the Damien Hirst art market still has a healthy level of demand, at the same time attracting a new audience of collectors, as pointed out by the head auctioneer Oliver Barker. Being on the art scene since the 1980s and rising to prominence during the 1990s, Damien Hirst has been making art prolifically throughout the decades, with no intention of slowing down. Having an unapologetically commercial approach to art, his works can still be found at a range of price points, despite his fame. The art advisor Todd Levin argued that we are not yet at the point where we could estimate whether or not the works by Hirst are historic. However, being a central figure in the Young British Artist movement, Hirst is certainly recognized as a significant part of modern British art history, continuing to challenge the boundaries between art, science and religion. All of this should be taken into consideration if you’re looking to invest in Damien Hirst art. Should We Judge An Artist by His Art Market? 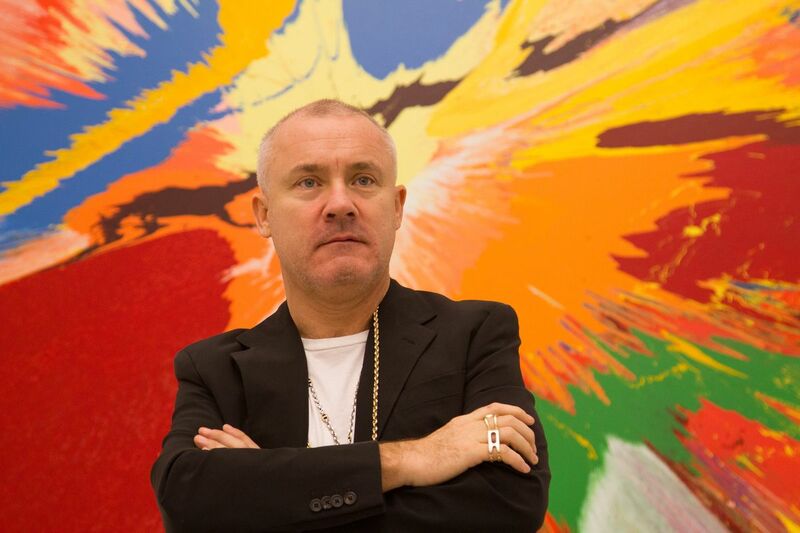 While most of the analysis of the Hirst’s fortunes are based on his auctions results, Felix Solomon from The New Yorker argues that this is a completely wrong approach, which misses “just how successful he has been over the past decade.” He points out that, since 2008, the artist has been selling hundreds of millions of dollars’ worth of art directly to collectors, bypassing the auction houses and the entire gallery system. Since he stopped playing by the established gallery-system rules and freed himself from these constraints, Hirst has been selling his work for whatever the collectors would be willing to pay for it, which is not as visible as the public auctions are. The rules of the gallery system game have always been the same – selling the works “at below-market prices, thereby allowing their collectors to feel that they’ve made a profit on every purchase,” all based on the idea “that all artworks have a secondary-market value.” Indeed, contemporary art is a highly bankable commodity, for some being an investment similar to stocks or hedge funds. However, there is a significant gap between what artists earn selling their work and what a collector could make by selling the same items, as first seen in the famous Scull auction in 1973, as artists still do not receive royalties on sales of their work in the secondary market. Damien Hirst boldly exited this game with his Sotheby’s auction sale in 2008. While he’s back to working with galleries now, he’s now calling the shots and the prices, as Solomon explains. 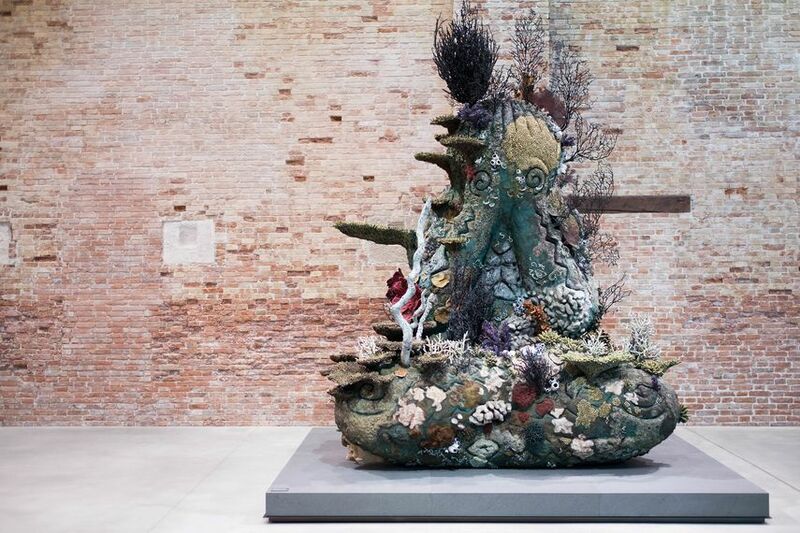 Described by many as Hirst’s most ambitious project to date, the famous 2017 Venice show titled Treasures from the Wreck of the Unbelievable was received with mixed reviews from the critics. A decade-in-the-making extravaganza, the exhibition spanned Venice’s two main art venues, Palazzo Grassi and the Punta della Dogana, filling them with 189 objects depicting mythological warriors, monsters and ancient royalty, all supposedly lost in a legendary shipwreck 2,000 years ago and now raised from the Indian Ocean at Hirst’s personal expense. 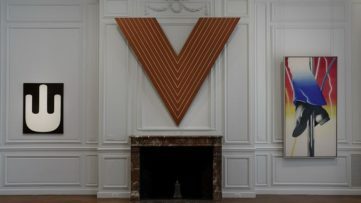 While some critics described it as “devoid of ideas, aesthetically bland, and ultimately snooze-inducing”, the artist himself claimed, as mentioned above, that it totaled $330 million a month before the exhibition closed. After having sold straight out of an auction house, it seemed like an obvious next step for the artist to sell straight out of a museum show. However, it remains to be seen what will happen with these works on the secondary art market. 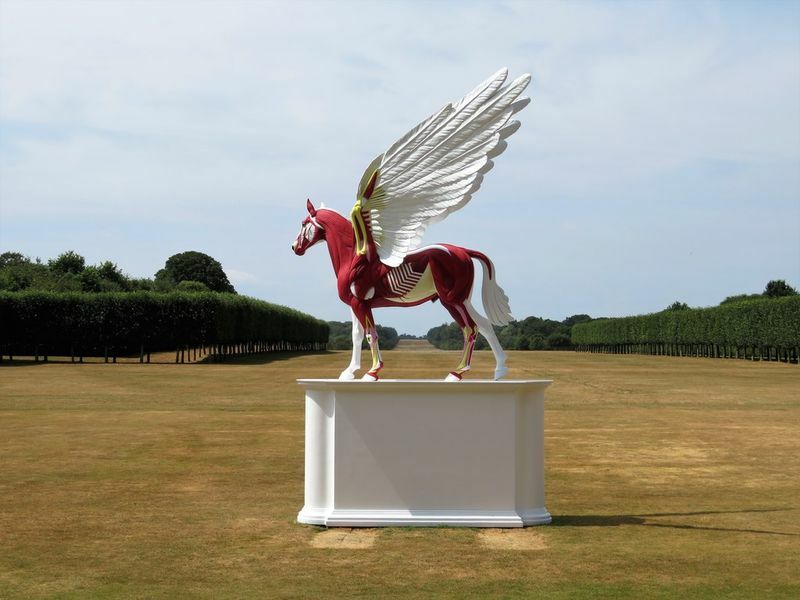 Meanwhile, the artist continues to be prolific with his work and exhibiting, mounting the solo show Damien Hirst at Houghton Hall: Colour Space Paintings and Outdoor Sculptures in January 2018 and Color Space Paintings, which opened at Gagosian Gallery in New York in May 2018, along with nine other group exhibitions which took place during 2018 and 2019 around the world. 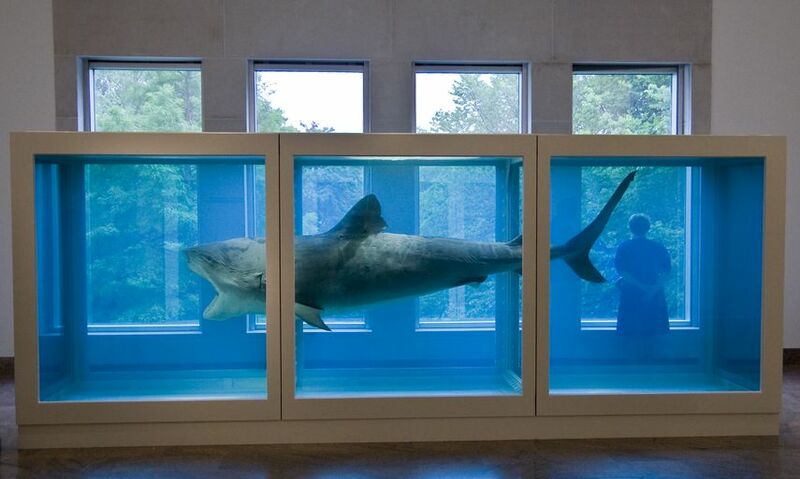 Currently, fifteen pieces from Hirst’s Treasures from the Wreck of the Unbelievable series are on display in the Haifa Museum of Art‘s group show. Titled Fake News – Fake Truth, it will be on view until September 1st, 2019. Also, seven of his works will go on show among the woodlands and glades of the scenic art space of Yorkshire Sculpture Park from April 13th until September 29th, 2019, including the work The Virgin Mother from 2005-06, Charity from 2002-03 and Anatomy of an Angel from 2008, while Demon With Bowl, a 60ft-tall, headless bronze statue from his Venice exhibition, will become the centerpiece of Kaos, the new club at the Palms Casino Resort in Las Vegas. Featured image: Damien Hirst, Doha 2013 via Gazanfarulla Khan. Used for illustrative purposes.